Take a closer look at the Linux Live USB Creator and you’ll see it’s not just another “me too” utility, though -- the program really does have enough features and functionality to stand up against the best of the rest. You get wide distro support, for instance (the official list includes Ubuntu, Fedora, Debian, OpenSUSE, Mint, Slax, CentOS, ArchLinux, Gentoo, PCLinuxOS, Sabayon, BackTrack, Puppy Linux and more – that’s now 360 in total). If you have a LiveCD or an appropriate ISO, IMG or ZIP file then Linux Live USB Creator can use that as a source. But if not then you can have the program download your preferred LiveCD by simply selecting it from a list. And this is nicely implemented, too: it’ll even run a quick speed test on multiple mirrors to find out which one is the fastest for your location. Of course there’s support for persistence, along with a host of other advanced options. 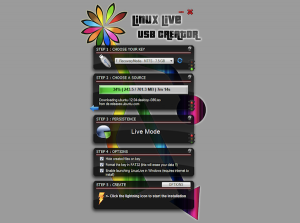 But none of these get in your way: a neat interface means Linux Live USB Creator is very straightforward to use. Perhaps most convenient of all, though, is an option to “Enable launching LinuxLive in Windows”. When we enabled this on our test PC, the program didn’t only download and install our chosen Ubuntu LiveCD. It also added a copy of portable VirtualBox to the USB key. And this enabled us to launch Ubuntu in a VirtualBox window on our Windows 7 desktop, without having to reboot first (although of course we could boot from the key as well); now that’s a thoughtful touch. There’s still more, though. The program can check your ISO file integrity to tell you if it’s corrupt, for instance; it’s able to preserve data on your USB key, formatting only when necessary; its list of supported distros gets updated automatically, no need for further downloads; and the list goes on. If you’re looking for a simpler way to sample Linux on your Windows PC, then, Linux Live USB Creator could be worth a try: it worked well in our tests, is packed with powerful features yet remains very easy to use.